Welcome to this extra issue of Grower Gateway aimed at providing the best practice approach in areas that growers can still control during an agricultural drought, for example burn-off and harvest. We spent some time with Mark Stalham yesterday (Thursday 26 July) and captured his thoughts in these videos. Finally, we have attempted to paint a picture of the water availability across the country. Dr Marc Alison, Senior Research Associate at NIAB CUF said: “It is too late now for nitrogen to have any impact on yield potential, all you would do is green the canopy up a little bit." Marc's colleague at NIAB CUF Dr Mark Stalham added that he did not foresee problems with achieving skin-set this season as these issues are normally caused by excess water around the tuber, something that is clearly not an issue this year! However, while talking at SPot Scotland this month, he mentioned that unnecessary use of N at this stage could cause problems with skin-set, so it is best avoided. Watch a video of Marc and Mark discussing N use at this late stage. When is a drought, not a drought? Who decides when Great Britain is in a drought? In an article on the 11 July, AHDB's Dr Nicola Dunn, a water specialist in our Resource Management team, said that "...hot weather and low rainfall has resulted in an agricultural drought." While bodies such as The Environment Agency and Hydrological Outlook UK are still using terms such as 'prolonged dry spell' and 'heatwave'. However, The National Drought Group (NDG), chaired by the Environment Agency’s Chief Executive, met on Monday 23 July. "We are in a continuing period of prolonged hot and dry weather. June 2018 was the driest June since 1925, with a rainfall total for England of only 15 mm. One water company, United Utilities, has announced its intention to impose a hosepipe ban (“Temporary Use Ban”) in parts of the North West from 5 August. The other water companies do not currently intend to introduce hosepipe bans, and there is no threat to essential public water supplies. But continued dry weather into autumn could see the risk of some further restrictions and further environmental impacts across the country. The water companies, the Environment Agency and others are taking action to reduce the risk of further water restrictions and to ensure that water users and the environment itself continue to get the water they need. Participants agreed to step up their activity on all fronts." On 19 July, the Scottish Environment Protection Agency Water Scarcity Report increased the alert levels for some regions. See the water availability picture from our SPot Farms later in the newsletter. Of course, the issue for growers is not the general water availability picture, but whether water can get to crops. In the July 20 issue of Potato Weekly, we revealed the proportion of the GB crop with irrigation available last season was 49%. So, with over half the country's potatoes relying on rainfall alone - a look at the 'long term rainfall analysis' tab on the AHDB Weather Hub shows just how dry this year has been. Looking at the Eastern Scotland, North East and Central regions on the map above, areas where there are large numbers of potatoes growing, in each region June and July 2018 are showing as the driest June and July ever. By way of example, the Central region has seen 14mm of rain in the two months combined, though at the time of writing there are still 4 days remaining in the month (and thunderstorms forecast). The next driest two month period for that region was the famous drought year of 1976, which 'enjoyed' over twice as much rain during the same period with 35mm. 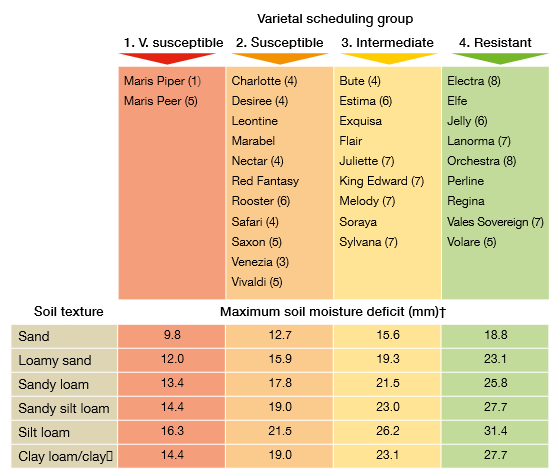 "Due to the exceptionally dry conditions being experienced this year we will not be supporting 1.0 l/ha Reglone without a valid SMART test pass (as per the Reglone label). Should conditions return to a more normal rainfall level we will review the advice as appropriate." "We have done work in the past on using Reglone in dry conditions at reduced doses. If that is not available then growers really do have limited options. "People may think of a mechanical flail, but flailing a crop under heat stress would likely pose a big risk of internal defects. "Growers considering this route, should consider taking crops out in the very early morning when they've had a chance to rehydrate overnight." If considering chemical treatments in these conditions, please speak to your advisor, or chemical company to discuss best practice and the options available. View a video of Mark Stalham discussing all burn-off options. "Many crops, particularly those that are unirrigated, will have effectively stopped growing in the last week or ten days. A deluge of water could cause growth cracks. "The heat-stress tubers are under, particular when many have poor canopy cover, means we have seen in-field sprouting and we will continue to see that as long as the hot weather continues. "We've had calls asking if the use of MH as a growth inhibitor would help. Crops under this much stress are highly unlikely to take-up MH to the required amount to prevent these problems. All that is likely to happen is that you would further restrict yield." Watch a video of Mark Stalham discussing in-field sprouting and secondary growth. Read Dr Anne Stone's guide to MH use here. “In the last two months we’ve emptied three reservoirs, we’ve never even emptied one before! It is the equivalent of a year and half’s water, by comparison last year we used about a third of one reservoir. "mostly at night and using boom irrigators (rather than rain guns) wherever possible to avoid evaporation. “It is so dry that we’re having to do some irrigation in the day too. We had a thunderstorm last night and one field caught 14mm of rain. I’ve just been walking there and you wouldn't know it had rained at all. "[irrigation] is absolutely vital at the moment to keep the soil moisture deficit from rising too high, so the best advice would be to top up little and often. There is no point putting on significant quantities of water only to see your efforts literally evaporate into the air." The work conducted at Elveden last year, by NIAB CUF, contributed to AHDB Potatoes new Water Management Guide, improvements to the 2018 version include more detail on varietal scheduling. Given the lack of rain, growers may find reduced yields and high dry matter contents. This will mean that bruising could become both more common and more damaging if potatoes are in short supply. We have a harvest guide and videos available for you to view and share with staff. The dry weather will invariably affect potato physiology as they go into storage after harvest. Now is therefore a good time to start thinking about your storage regime. The latest data on in-store airflow, tuber respiration and sprout suppression is included in the 3rd edition of Sutton Bridge Crop Storage Research’s (SBCSR) Potato Store Managers’ Guide, which was released last month.